Kia ora and haere mai, welcome to the 27th instalment of 9mm for 2018, and the 199th overall edition of our long-running author interview series. Wow, big milestone approaching there! Thanks for reading over the years. I've had a lot of fun talking to some amazing crime writers and bringing their thoughts and stories to you. You can check out the full list of of past interviewees here. If you've got a favourite writer who hasn't yet been featured yet, let me know in the comments or by message, and I'll look to make that happen for you. 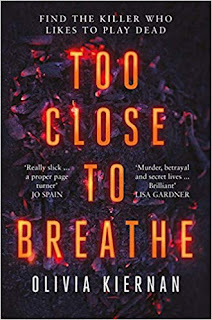 Today I'm very pleased to welcome Irish author Olivia Kiernan, whose Dublin-based debut thriller Too Close to Breathe has been getting some rave reviews, and has already been sold into France, Germany, Russia, Japan, and the Czech Republic. I met Olivia recently at the Theakston Old Peculier Crime Writing Festival in Harrogate, where she was one of the authors taking part in the Murder Mystery Dinner. It's one of those stories that seems like a meteoric rise for a debut author, but like many Olivia has been writing for many years, alongside being a chiropractor. 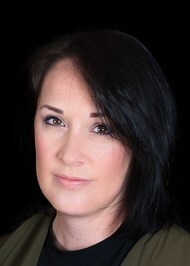 She has been shortlisted and longlisted for several short story prizes, as well as the BBC's scriptwriting competition. 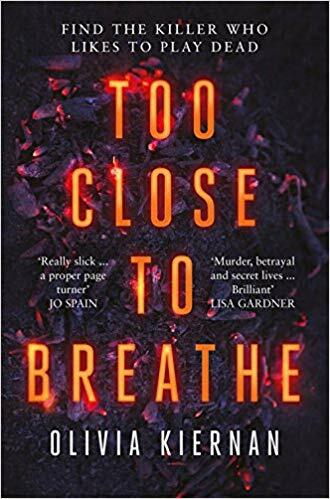 Too Close to Breathe centres on the apparent suicide of respected scientist Dr Eleanor Costello, found hanged in her immaculate home. Brusque DCS Frankie Sheehan, a trained profiler, is handed the case. The Irish Times described the book as "a hard-boiled take on Tana French" - high praise indeed, and Olivia as "a talent to watch". Olivia is currently working on her second novel, out in 2019. But for now, Olivia Kiernan becomes the latest author to stare down the barrel of 9mm. I’m not sure I can stick to just one but that’s the beauty of crime fiction, right? There are many to choose from. I must mention Lisbeth Salander in Larsson’s The Girl With The Dragon Tattoo. We are thoroughly engaged with her skill, ingenuity, and loyalty. A proper hero. And I’m going to sneak in Thomas Harris’ Clarice Starling. Clever, dogged and courageous. You did say two favourite heroes, right? The first book that made me feel like a proper reader was The Animals of Farthing Wood by British author, Colin Dann. The book was over 250 pages long which felt like a tome to me as a kid but I remember being swept up in the adventure and feeling completely engrossed in the story. It was like I was shown how books worked and why people loved them. The novel dealt with themes of survival and bravery, themes that appear in my work all the time. I think every writer has a stash of stories that shouldn’t ever see the light of day. I wrote bad poetry in my teens, twenties and even now. I have had a few short stories long-listed for competitions. Every now and then I like to add to my short story attempts. The craft is so tight. You don’t have room to play around with the story’s intention. It has to be clear. It’s a great format to practise. I’ve also written scripts, sitcoms, other novels and I’ve just about managed to keep a blog going, with the odd update, for the last four years. Obviously I read a lot but to be honest writing still feels like the activity I want to do most. There is nothing more enjoyable to me than a few hours of writing, particularly if I manage to complete a tricky scene. It’s very satisfying. But otherwise, I love to get outdoors and although I’m not as fit as I once was, I run about four times a week. I grew up a member of an athletics club and ran up to national level in Ireland but stopped competing when I got to my late teens. However, the urge to put my trainers on and get out for a jog has never left. I’m from Ireland originally but live in Oxford in the UK, so again I’m going to cheat here. I will say if you ever visit Co. Meath, where I grew up, do visit the Boyne Valley and the neolithic tombs of Newgrange, Knowth and Dowth. They are over 5,000 years old and are incredible. You can go inside the chambers and stand where the people who built them would have stood. It will make the hairs rise on your arms. For Oxford city, most people gravitate towards tours of the universities, which are stunning but as a crime writer I have to point you to the Oxford Castle and Prison Tour. It’s so interesting and will give you a really great sense of the layered history of the city. I’m going to say Toni Collette. Amazing actress with such a fantastic range. She’d probably need her full acting palette were she to read my script. I have to say Too Close to Breathe. It’s the book that gave me a publishing deal. But, of course, as a writer you’re a very fickle mother and affections are easily won by a new project. My reaction was the same as I feel now every time I sit down to the computer. One of disbelief that I get to do this every day and that I have a publisher. I’ve worked hard to get here but many writers do and don’t get this chance. I celebrate that every day by turning up at the desk and writing. Seeing Too Close to Breathe on the shelf for the first time was fantastic. I remember not wanting to sign the book for fear of defacing it. I’ve probably not been ‘out’ long enough for anything unusual to have happened but I do look forward to gathering a few anecdotes down the line as long as I come out unscathed at the end of them. I will say that one of my favourite things at author events and signings is when readers ask when the next Frankie Sheehan book is coming out. I don’t think that will get old. Thank you Olivia. We appreciate you chatting to Crime Watch. You can find out more about Olivia and her books at her website, and follow her on Twitter.